OAKLAND -- Draymond Green walked away from the interview podium in the corner of the floor at Oracle Arena. After some verbal sparring with late-night TV's Guillermo, he fielded a question about something that could rear its ugly head in the NBA Finals. More so than the health of Kevin Love and Kyrie Irving, the presumed defensive matchup of Andre Iguodala vs. LeBron James or how the Cavaliers plan to defend the Warriors' uniquely lethal 3-point arsenal, something else could tip the scales in this rematch for the ages. That something else is Draymond Green. Or, more accurately, Draymond Green's emotions. The more you look at the Cavs' matchup problems in this series, the harder it is to find a weakness for them to exploit. 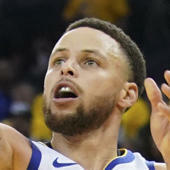 They've shot and made more 3-pointers per game than the Warriors have in these playoffs, but they get to those shots more traditionally -- drive-and-kick or ball-reversal, as opposed to, say, side-stepping a 7-footer and shooting over and/or around him, like Stephen Curry and Klay Thompson did to the Thunder. But if the Warriors had one weakness exposed in a Western Conference finals in which they had to come back from a 3-1 deficit, it is their own No. 23. With his flailing leg-kicks -- to Steven Adams' groin, in particular -- Green dominated nearly three days of media coverage during that series. More important, he came close to getting himself suspended -- an outcome that could've turned the series, and perhaps the Warriors' 73-win season, upside down. With Green under the microscope -- he's' two technicals or one flagrant away from an automatic one-game suspension -- wouldn't it behoove the Cavs to test him? To get under his skin in ways that Green himself has become so adept at doing? "Nah, I'm going to play my game, and whatever happens, happens," Green told CBS Sports Monday, about 30 hours before tipoff in Game 1 of the Finals. "I don't worry about it. I'm not going into the game worrying if they're going to try to bait me or not. I'm going to play my game and control my emotions." Control his emotions? Is that a promise or a threat? Because emotions are ingrained in Green's game, and even after he was under league scrutiny following his Game 3 groin shot on Adams, Green vowed repeatedly to just be himself. Other than playing better -- which he did as the series evolved -- he didn't really change. "I'm going to play basketball and do what I do on the floor," Green said. "What's going to happen is going to happen anyway. What I try to do isn't going to stop it, so I just play my game." If Green gets two technicals in the series, he'll automatically be suspended for one game under NBA disciplinary guidelines. The same holds true if he gets called for a flagrant foul, penalty-one, which is assessed for unnecessary contact. If Green were to receive a flagrant-two -- unnecessary and excessive contact, which is how his groin kick to Adams was adjudicated by the league office -- he'd be suspended for two games. Even after pushing himself to within one infraction of a suspension, Green continued to play on the edge in the Thunder series. OKC officials believed the league should've looked more closely at Green's trip of Enes Kanter in Game 4. In Game 5, Green flailed his leg wildly twice more, making contact with Kevin Durant and Russell Westbrook. In Game 7, double-personals were called on Green and Adams, though the Thunder argued behind the scenes that Green pulling Adams to the floor qualified as flagrant material. "After Game 3, he was sort of on probation, you know?" coach Steve Kerr said. "So when he had bad calls, he may have discussed those calls with the referees, but he did it in a better way and didn't get himself in any trouble. He knows he's got to be somewhat careful because of the technical foul rule and the flagrant stuff as well." Dwight Howard was hit with an automatic one-game suspension for collecting his fourth flagrant foul point of the postseason last year, but it came in the clinching game of the Western Conference finals, which the Warriors won 4-1. Thus, the suspension was served in Howard's first game of the 2015-16 regular season. Howard also entered the 2009 NBA Finals against the Lakers with five technical foul points, and though the Magic lost to the Lakers, Howard managed to survive the series without a suspension. Three flagrant points and six technicals are permitted before automatic suspensions kick in during the playoffs. The NBA's longstanding practice of reviewing flagrants the next day to determine if they should be upgraded or downgraded -- plus a new practice of issuing reports about both correct and incorrect calls in the last two minutes of regulation and overtime -- were intended to foster transparency. In some cases, though, they've focused more attention on the officiating than ever -- and put more pressure on the officials. Now in the Finals, Green being so close to the edge has raised the specter of his aggressive, emotional play morphing from unwanted subplot into something that could alter the outcome of the series -- not to mention careers and legacies. All of this brings us back to Green's promise to control his emotions, which isn't necessarily compatible with his answer to another question Monday about what he's going to bring to the floor in his second straight Finals. "What I bring to every game," he said. "What I've done all year." Or maybe, for the sake of being able to stay on the floor, just a little less.